I haven't put these in any particular order really as each day changes I tend to switch things around so I don't get bored. So starting with my trusty Garnier Micellar Cleansing Water. I adore this product and can't say anything bad about it. It's affordable and removes my makeup quick and easy. Truth be told I tend to use this before having a nap. I absolutely hate sleeping in makeup, it freaks me out and I honestly don't think I've ever went to bed at night with makeup on to have to take it off the next morning. The micellar water is perfect as it removes my makeup with a few cotton pads and then I'm ready to nap! I have quite sensitive eyes and tend to have a little bit of a panic attack if I try to remove my eye makeup with anything oily or creamy. However mid last year I discovered the Simple Kind To Eyes Eye Makeup Remover and it's honestly the best thing I discovered. It's just like a micellar water and so theres no oily or greasy feel to it when I start to remove my eye makeup with it. It's also really gentle and doesn't cause any irritation, great if you have sensitive eyes or skin! I'm still loving the Sanctuary Spa Feather Light Moisture Spray for when I feel like my skin needs a little hydration mist. Although it feels quite oily when sprayed onto the skin I don't feel like it leaves a greasy residue on the skin. It's great for no makeup days when you haven't put anything on your skin. It's also really refreshing and would be great for long travel journeys if your skin starts to feel dry or tight. I picked up a mini of the Simple Soothing Face Toner to try out. I haven't used a toner in ages and so decided to give this a try and see if I like it. After removing my makeup I simply just run this over my face with a cotton pad and it just leaves it feeling really refreshed which I like. Although I'm not sure if its making any difference to my skin using it or not to be honest. I'm still in love with the Botanics range and so of course I'm using the All Bright Night Cream and the Radiant Youth Eye cream. I've gone through both of these products so much and I just keep re-purchasing them over and over again because I adore the results they give. They both contain brightening hibiscus and brighten your skin giving you a healthy glow, and trust me it actually works! I also adore the fresh rose scent to the range and I honestly just cannot get enough of the products. I will be the first to admit that I used to avoid the No7 counter like crazy when I'd walk into Boots. But when I started working there last year I decided to give some of their products a try. The No7 Hot Cloth Cleanser is probably my favourite hot cloth cleanser I own. It just feels so luxurious on the skin and leaves it feeling refreshed and pampered. I have used this to take off my makeup and it does a great job, I've also just used it to pamper my skin and it leaves it feeling just as refreshed as it would if removing makeup. I absolutely adore this product. You do get a muslin cloth with it but it wouldn't be the softest thing you'd get and I don't tend to use it. But over all the product is a clear 10 for me! Something I use but I'm not so crazy about is the No7 Quick Thinking Wipes. Now I'm not one who goes crazy for makeup wipes, if anything my skin punishes me for using them and I will break out if I just use wipes. However I bought about 10 packs of these (truth be told, discount made me do it) back in December and they just don't do it for me. I will sometimes use a wipe to take the bulk of my makeup off before going in with a cleanser. But if I do go to use a face wipe I like it to be covered in product so that its damp and will do for my whole face. The No7 wipes I find aren't very damp and after rubbing one across my forehead and across one cheek I feel like all the product is gone out of it. Again this could just be because I don't tend to like face wipes but maybe they'd work for you! A newer product to my routine is the Soap and Glory Peaches and Clean Cleansing Milk. This just melts off your makeup instantly and I really enjoy using it. I can't use this on my eyes though as it is fragranced and just stings like hell. However it's a great affordable cleanser and gets your makeup off in less than a minute so it's great when you want it off quickly. It's also suitable for all skin types which I think is great so you know it'll work for everyone. I decided to include these 3 body skincare products I'm using at the moment because technically they're still classed as skincare, right!? The only thing about these is they're all one brand because well you can't beat them, can you! The Scrub Of Your Life has honestly changed my attitude towards exfoliating. As its in a tube and not a pot it's so much easier to use and avoid any mess that a pot may cause. What I also love about this is that when you scrub it into your skin it foams up almost so you know where you've scrubbed and if you've missed any spots. This has removed all those little bumps from my arms and legs and leaves my skin feeling so soft its crazy. I'm already near the end of my second tube and this is definitely something I will continue to buy. I'm not one for tanning but when you find a product that you honestly cannot do wrong with it's pretty fun to play around with. The Righteous Butter Sunkissed Tint Bodylotion is the easiest tanning product I've ever used in my life. It's already developed as soon as you apply it to your skin meaning you literally can't mess it up no matter how bad you are with tan. It also washes off straight away which is bloomin fab but also beware of water cause you don't want water droplets tan marks. There is no horrible biscuit smell to it instead just your typical Soap and Glory scent. I love playing around with this when I want a change and love the fact that if I don't like it I can wash it off straight away and it's as if nothing ever happened. Finally since I'm exfoliating and sometimes tanning means I actually make myself use a body lotion. The one I'm currently loving is The Righteous Butter this is just so thick but dries quite quickly. It helps leave my skin feeling soft and refreshed which I really like. Also it helps that it has such a relaxing scent to it. The No. 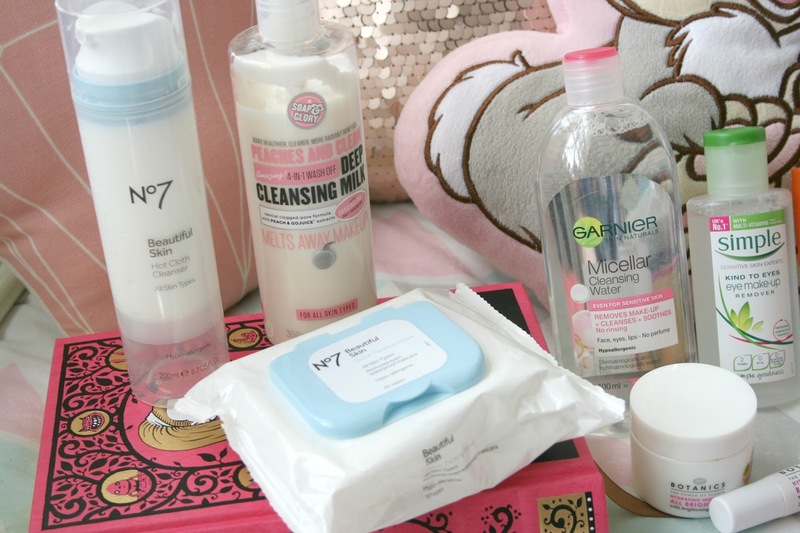 7 hot cloth cleanser is something I would love to try out soon! My current fave skincare product is a face cream from the oils of life range from the body shop~ It gives me so much hydration and leaves my skin feeling so soft. I tried the Botanics Day cream and also the Night cream in the past, and I loved them! The night cream was super hydrating and I loved the scent of it. 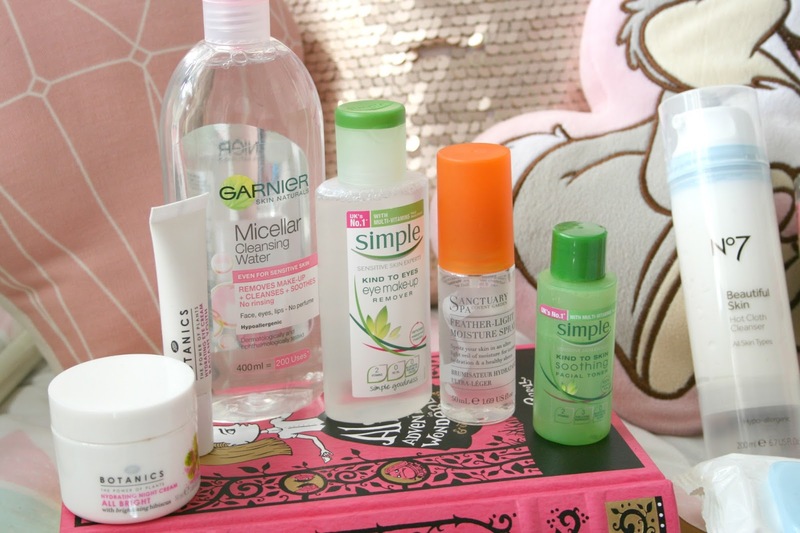 I purchased recently the Garnier Micellar Water but I haven't used it yet! I love the Sanctuary Spa spray, I use it on my body but haven't tried it out on my face yet- looks like I'll give it a go!